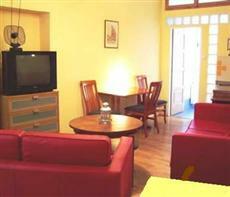 If you are looking for a nice place to stay in Prague – Czech Republic, you should head to the Platan Pension. This lovely accommodation is located right in the historic center of the city, in the Old Town, near many of the tourist sites and attractions in the area. Guests can easily reach the Old Town Square, which is home to the Tyn Cathedral, the St. Nicholas Church, the Jan Hus Memorial, and the Astronomical Clock. Other sites nearby are the Charles Bridge, Josefov, which is a medieval Jewish neighborhood, the National Theatre, and the State Opera. Just ten minutes away by foot is Wenceslas Square. This location is a great starting off point for anything you would wish to see and do in Prague. At the end of a long day in the city, the Platan Pension is a great place to come home to for comfort. It offers private and quiet accommodation in the bustling city. Guests can prepare a meal for themselves and unwind in their apartment.